I’d like to think I’ve embraced the advances in technology as much as the next guy, but I have to admit I was one of the last people I know to give up flip phones. On my first solo work trip years ago I didn’t own a laptop or even a cell phone, which meant I had no way of checking my email until I got back in the office. As an added bonus, if I didn’t bother to call my boss and check in every couple of days, he had no way of knowing where I was or what I was up to. Man, I miss those days. I love technology, but sometimes it’s nice to have a break. Maybe that’s why I fought getting a Smartphone for so long, but in reality it’s just the way things are today and the reality is this advancement in technology helps me stay connected and be productive anywhere I go. Remember when all a mobile phone could do was make calls? Back then I couldn’t imagine I’d be able to use my phone to check email, browse the web, pull up videos and surf news feeds. Today I can easily do twice as much as I could back then and from anywhere I have a signal. But as great as this technological advancement is, there really is a time and a place for everything and that includes a time to disconnect from phones, iPads, computers, etc. Last summer we invited another family to go out with us on the water for a great day of boating. Our friends have a typical teenager who spent most of the day with his nose buried in his phone—playing games and missing out on the beautiful scenery all around us. His parents literally had to beg him to put his phone down on one occasion just so he could see what the rest of us were enjoying. Now to be fair, this isn’t just a boater or a teenager issue. The next time you go out to eat, take a look around the restaurant. It’s nearly a guarantee you’ll see at least one person on their phone instead of engaging in a conversation. What is so important that it can’t wait until after the meal? I have a co-worker who established a rule for when he goes out to dinner with friends. He has everyone put their phones in the middle of the table when they sit down and if anyone has to pick up his phone during dinner, he also gets to pick up the tab for everyone. That’s one rule that I think would clearly motivate most of us to stay off our phones while at dinner. I’d like to see something like that extended to boats. 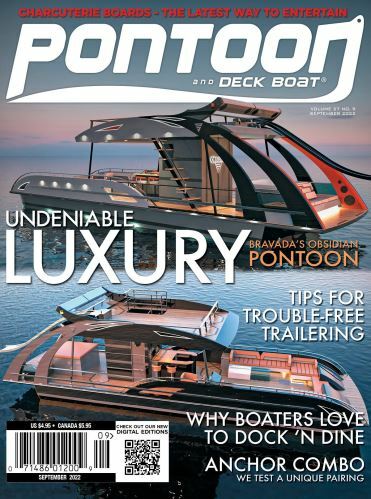 I’m proposing that all pontoon and deck boats should have a “gadget-free zone” at least while underway, unless the phone is being used as a navigational aid or to take a photo. Instead of looking down at your phone, look up and enjoy the beauty that surrounds you. There’s no need to talk or text with those not onboard about the birds or the fish that you’re seeing; it can wait. Nothing is more frustrating than inviting a guy who wants to Facebook what he’s doing at that exact moment who ends up missing out on the real experience. My advice is to make your posts back at the dock—or better yet, when you get home. For those who can’t fight the urge to respond to a text or email the second you get it, reply back but do it quickly while also being polite. Something like, “Sorry I can’t respond, I’m in a gadget-free zone right now,” will work. Then call or text back later. I think that could work because in reality, we all need to disconnect every now and then and the best place to do it is on a boat.